Do you remember our cool ‘Girl bedrooms inspired by Disney’s Frozen’ post? Well, it caught the eye of our friends at Hometalk. They are giving away the most delightful items to invigorate your home with color this Spring and invited us to join in the fun! 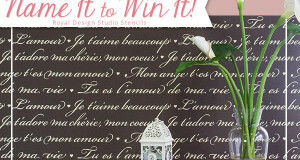 Details on the Giveaway: For a chance to win our premium stencil kit, all you need to do to enter is to follow Royal Design Studio on Hometalk. It is that simple! The last day to enter is Saturday, April 12th by midnight, so don’t wait too long! Details of our Prize: We are giving away a premium stencil kit so you can replicate both girl bedrooms (see above) featured in our ‘Frozen’ post! 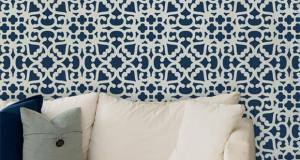 The kit includes the Starry Moroccan Night Stencil, Large Flourish Allover Stencil, Royal Blue 2oz. Stencil Crème, Peacock Fancy 2oz. Stencil Crème, 1” stencil brush and our 1½” stencil brush! Valued at $175, this fun kit could be all yours for FREE! Think of all the magic you will create for your little princess just for following Royal Design Studio on Hometalk! For more details, see Hometalk’s Giveaway Post. Good luck!